My mission to discover and try out new and interesting beads every month has sparked a new obsession. After falling in love with African Christmas beads, I find myself wanting to use them in everything, and I’m always on the lookout for other exotic trade beads to add to my repertoire. I found March’s new beads somewhat by accident, and although they aren’t trade beads, I couldn’t resist using them in a tribal design. I came across them while searching for some metal-free shank buttons for an upcoming PDF tutorial. I was thrilled when I found these adorable carved boxwood buttons with animal designs from Unique Buttons on ArtFire. I was pleased not only with the design, but the price as well, so I kept looking around, and found the most amazing lizard button, which I’m sure will make an appearance in an upcoming challenge bracelet. Then I stumbled across a pair of horn shaped vintage Cherry Brand beads. They are so gorgeous, with beautiful yellow, white and brown stripes. I just had to scoop them up! It took awhile to decide exactly how I was going to use these beauties. The curved shape makes them tough to design with, especially without using beading wires. I decided that suspending them in a necklace would be best, so that movement would help them look at home. And because I wanted to use both beads, I had to find a way to achieve a nice balance. Then I had to choose a palette, and a technique for the necklace base. After going through my bead stash, making sketches, and imagining different approaches, I finally decided to make an eclectic charm necklace on a herringbone base. I was tempted to go with an ice cream palette, since the beads have a sort of banana-and-butterscotch-ripple thing going on. 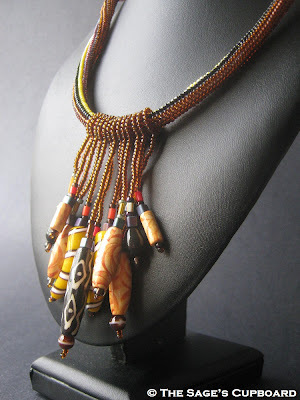 But it would be tricky to make it look elegant, and allow the beads to blend in to the design. Luckily, my need to use trade beads everywhere took over, and I came up with a wild and fun African-inspired palette instead. I included a single bead just larger than the horns as a focal piece, as much to keep them from clinking together as for looks. This was one of the most difficult necklaces I’ve ever made. The techniques are simple, but I ended up using a size 13 needle for the entire rope section, and after a few days of work, I was afraid I had ruined my stitching arm. And here’s a handy tip: straight needles cannot pass through curved beads. Luckily, I have a packet of twisted wire needles, and they worked perfectly. I actually completed this piece weeks ago, but I’ve been keeping it under wraps, waiting to see if it was chosen as a finalist in this year’s Bead Star competition. This is the first year that the contest has had a category for beadweaving, and I was very excited to enter something. The Bead Star contest is hosted by Interweave Press and Beading Daily, with prizes provided by some incredible companies like Artbeads.com and Beadalon. 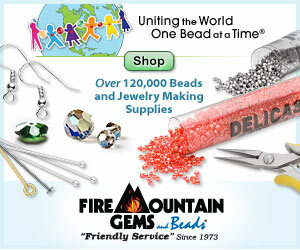 There are categories for seed beads, crystals, metals and other materials, as well as a fun heart inspired category. There are some absolutely gorgeous designs to see and vote on this year. Best of luck to everyone who entered! Meanwhile, I’m still on the hunt for exciting new beads. So far I’ve discovered some amazing new styles and shops, and I’ve got months to go. I have a feeling that I’ll want to keep up with this little tradition beyond 2011. What new discoveries or experiments in beading have you made this year? I love the exotic look of this necklace and the beautiful, earthy palette! Love it! It's a great original design. Thank you! I was so worried about how any design using these beads would turn out. I'm very happy with the end result! Your design for these beads are spot on! I am so inspired by how you make beads work for you. I never would have chosen those beads but in that necklace they are perfect!